Doyon Foundation hosted the Where Are Your Keys (WAYK) language training in early November. 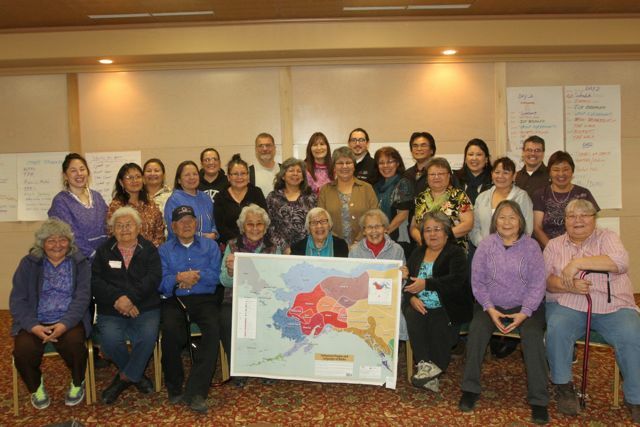 Approximately 30 people participated in the four-day training in Fairbanks, and six of the nine Native languages in the Doyon region were represented. Participants at the Foundation’s language training workshop in November. The training was part of the Foundation’s new language revitalization program, which was established in 2012 to address the rapidly decreasing number of fluent speakers of Alaska’s Interior Native languages. Doyon, Limited supported the establishment of the program last year with a $150,000 contribution to the Foundation. Evan Gardner, the developer of WAYK, facilitated the training, which covered an accelerated language-learning method where participants are not just the learners, but are also responsible for teaching others. Participants were asked to identify their next steps and commit to offering a local language event, or working directly with supportive speakers. “What I really appreciated about this workshop was that we covered techniques for teaching. I came in thinking, ‘I’m going to learn some words in my language.’ However, I’m really happy that I’m learning techniques to teach our language. Even as I learn, I can still be a teacher of our language,” said participant Bessie Titus of Minto. The Foundation found out in October that Gardner was available to facilitate a November workshop, and staff moved quickly to schedule the event around other major local events, including the Alaska Federation of Natives Convention and Tanana Chiefs Conference Education Summit. “Given our short recruitment timeline, I was definitely pleased and surprised with the level of interest and turnout. Those who attended were enthusiastic, motivated and engaged. The training had energy and strength, and was a great start,” Chase said. The Foundation plans to offer a series of follow-up audio-conference meetings to support local efforts and work toward building a learning network. A follow-up training is also expected to take place in year two. View highlights of the workshop in a YouTube video produced by Adam Demientieff at http://bit.ly/1b2X2MO, and see workshop photos on the Foundation’s Facebook page at www.facebook.com/doyonfoundation. For more information on the training or the language revitalization program, please visit www.doyonfoundation.com or contact Malinda Chase at 907-459-2162 or chasem@doyon.com. Spend up to 30 minutes studying and learning your language, and spend another 30 minutes learning about and practicing different language-learning methods or strategies – that you can research online – and teach others. Set goals, starting with small achievable goals, like responding to common greetings and questions in your language, or learning conversation around a specific event, like sharing a meal, which could involve saying a prayer, asking for and passing food items, and identifying dishes and utensils. Learn the literal meaning, if available, of certain phrases, as this often provides understanding and insight and helps you remember a word. Cultivate and work with others. Language is a social tool and learning with others gives us real-life practice, builds our collective memory, and often gives us extra strength and resolve to keep going.